Well, there's another debate tonight. Will I watch it? No. I don't watch debates. And tonight? Well, I'm going to bed early. I get to open the store tomorrow, so I'll be up at 0300. I get to open it again on Tuesday, yippee skippy. Even though I won't be watching the debate I will bet that millions of others will be glued to their TV sets. They want to see Trump squirm in the hot seat. They will want to see just how low he's going to go; failing by what degree. If he mentions Bill Clinton, he fails. If he tries to justify his scumbag behavior by comparing himself to Bill it will be a terrible mistake. The only way he can even hope to stop the hemorrhaging of his campaign is to pull a Scarlett O'Hara. "Gone with the Wind," you know? 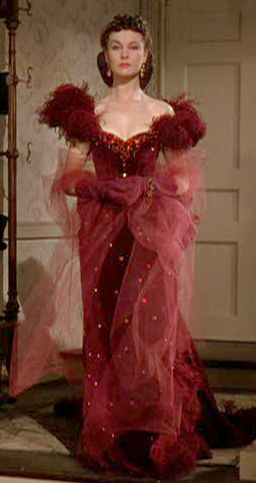 After Scarlett is caught with Ashley Wilkes, Rhett forces her to go to Melanie's party wearing a red, velvet dress. That's right, Trump's got to go to this debate wearing that red velvet dress. For him to be even partially successful, he's got to rise out of the gutter. The only parachute he has available is made of velvet, and lace, and sequins, and ostrich feathers, and it is a brilliant scarlet red. For him to even come close to saving his political career, he's going to need to prove that even a pig of a human being like himself has some small semblance of dignity. Nah, she's going to bait him to hell and back. "he's going to need to prove that even a pig of a human being like himself has some small semblance of dignity" - ain't gonna happen. he's always been a pig and always will be a pig. and his sons are just like him - pigs. I wanna hear hillary mop the floor with his ugly pig face! You know that if he brings up Bill she's going to bring up his first 2 wives, and how he cheated on them... and is probably still cheating. I want to Hillary to go high when he goes low, but if she drops a "pussygate" bomb I would be in heaven! I think an appropriate response to an attack on Bill would be, "Melania says that she has forgiven you, Donald, for what you said and did, and that she wants us to move on to the issues facing the country. I have forgiven Bill and agree with your current wife that we should be discussing the issues facing the country." Or even makes a compassionate comparison between herself and either one, or both, of his first 2 wives. She has no need to call him a serial cheater, the public will reach that conclusion on their own.